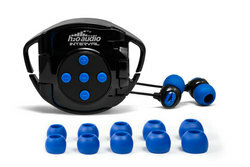 Swim with Interval 4G Waterproof Headphones and 4th Generation iPod Shuffle® Waterproof iPod® case - H2O Audio Announces Interval 4G Waterproof Headphone System for Swimming With the 4th Generation iPod Shuffle® - H2O Audio announces the latest generation of the Interval. The Interval 4G, designed for the new 4th generation iPod shuffle is the only waterproof iPod® case with integrated headphones designed specifically for swimmers and triathletes. H2O Audio, the leader in high-performance, waterproof, sweatproof sport headphones and accessories, today announced its latest generation of the Interval Headphone System. Designed specifically for swimmers and triathletes, the Interval 4G creates a no hassle way of using the 4th generation iPod Shuffle to bring your own personal soundtrack to your swim workout. Now in its 4th generation, the Interval is better than ever! Smaller, easier to use and integrated with the latest Surge 2G headphone technology, the Interval headphone system is the only way to bring your iTunes® files to your swim. Designed to quickly attach to your goggles, the Interval contains your own personal sound system entirely on your head, delivering crisp, clear sound while keeping your arms free of wires. Paired with an Interval hat or visor (sold separately), the Interval makes an outstanding running solution as well.